Mary Bledsoe's reading her testimony from a cue card and makes a small omission. Ray Mitcham and 1 Guest are viewing this topic. Mr. BALL - And give us as much help as you can? Mr. BALL - What is your---you have given us your address, haven't you? Mr. BALL - Can you tell me something, briefly, about your past life? Where you were born and what your education was and what your occupation has been? I was--I have been here 43 years in the neighborhood, and I raised both of my boys, and they are grown. Mr. BALL - Your occupation has been that of a housewife? Mrs. BLEDSOE - Yes. Well, I had rented rooms, but I had some money my father had given me. I had some money from him. ....Surviving are his wife, a daughter Mrs. Mary Bledsoe, Dallas; two sons, Porter Germany, Houston, and Peter Germany, Ennis; two grandsons, four brothers, and three sisters. Re: Mary Bledsoe's reading her testimony from a cue card and makes a small omission. Last Friday, November 22, 1963, I went downtown to see the President. I stood on Main Street just across the street from Titche's until the parade passed by. The I walked over to Elm Street and caught a bus to go home. The bus traveled West on Elm Street to about Murphy Street and made a stop and that is when I saw Lee Oswald get on the bus. The traffic was heavy and it took quite sometime [sic] to travel two or three blocks. During that time someone made the statement that the President had been shot and while the bus was stopped due to the heavy traffic, Oswald got off the bus and I didn't see him again. I know this man was Lee Oswald because he lived in my home from October 7, 1963 to October 14, 1963.
aunt by marriage, of Mary Germany Bledsoe. Bledsoe also saw a picture of his baby before she was even born. 19-month-old children are usually considered to be babies; especially first-born. Some aren't even talking by that age. In any case, Bledsoe saw her as a baby in the picture Oswald showed her, and that's what counts. Some aren't even talking by that age. In any case, Bledsoe saw her as a baby in the picture Oswald showed her, and that's what counts. Mrs. BLEDSOE - And so, that give me a lead, something to talk about, and I said, "Well, what kind of work do you do? "Oh, I do electronics," he said, and I said, "Well, there is some good jobs because you are young, and you can get a good job a young man like you." And then went on. Then something about him being in the Marines, and I said, "Well, that is wonderful. My son was in the Navy." And talking about him, you know, just getting to know him, and--but, "here is a picture of my wife, and picture of the girl, and the baby." Bledsoe: And then we got inside the house and he had a thing where this---pictures of his wife and baby, and he said he was in the Marine Corps, and I tried to be nice. If Bledsoe gave "more accurate" statements, she also must have given less accurate statements, right? Wait… Doesn't that, by definition, make her an unreliable witness? alleged hit man Russell Douglas Matthews, associated with Jack Ruby through organized crime activity. access to much of the following detail....but not only permitted Mrs. Bledsoe to testify, anyway. In fact, he encouraged her! Mrs. BLEDSOE - Well, I thought, "Well, he is gone," and forgot it. Mr. BALL - But, before you go into that, I notice you have been reading from some notes before you. Mrs. BLEDSOE - Well, because I forget what I have to say. Mr. BALL - When did you make those notes? Mrs. BLEDSOE - What day did I make them? Miss DOUTHIT - When Mr. Sorrels and I were talking about her going to Washington, he made the suggestion that she put all the things down on paper because she might forget something, and I said, "Mary, you put everything on a piece of paper so that you can remember it and you won't forget anything, you know, what happened," and that's when she started making notes. Mr. BALL - You have made the notes in the last week? Miss DOUTHIT - At my suggestion and Mr. Sorrels. Mr. BALL - You didn't make any notes during the week he was there? Mrs. BLEDSOE - No; I didn't pay any attention to him. …. 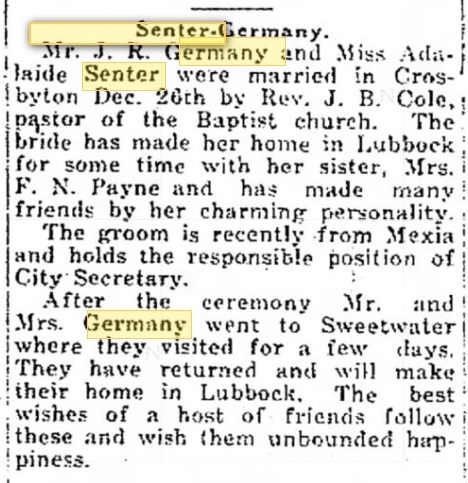 Her father, Dr. John W Germany, married the first cousin of Mary Bledsoe's ex, 24 years Dr. Germany's junior. Mary as a witness is confused, unpersuasive exactly where you discern clear meaning? …Mr. JENNER - And--when and if he obtained employment? And then went on. Then something about him being in the Marines, and I said, "Well, that is wonderful. My son was in the Navy." And talking about him, you know, just getting to know him, and--but, "here is a picture of my wife, and picture of the girl, and the baby." And I said, "Oh, she has got a baby, hasn't she?" And he said, "Yes." And everything he said, I had to pull it out of him to talk about something for him to say what it was. Mr. JENNER - But, he volunteered the picture of his wife and child? Mrs. BLEDSOE - Yes; he did that. Showed me that picture. Lincoln Co., TN. He died on 20 Feb 1993 in El Paso, TX. marriage was over. Died of a stroke. …I married then when I was 17, and then I moved around quite a little while I was married, but-and then my husband and I, we had trouble, and I divorced him in-oh, about in 1925, and I raised my two children by myself, and I have been in the place where I live 24 years, and over on the back, I was--I have been here 43 years in the neighborhood, and I raised both of my boys, and they are grown. …. ended in divorce.Mary was born in 1896 in Chatfield, TX. 28 Aug 1914. He died about 1980. 43 M ii. Porter BLEDSOE was born about 1925. He is a child of another man, not James Eulys BLEDSOE. born on 23 May 1908 in Clovis, NM. She died ….